Watching Manny Pacquiao consistently get the better of Adrien Broner on Saturday (I scored the fight 118-110 for Pacquiao), I realized that I had forgotten aspects of Manny at his best. My memories of his explosive 2006-2011 prime had faded. I still recalled a dynamic fighter with a rare combination of power, speed and frenetic energy, but, in hindsight, he had encapsulated so much more. His movements were so unconventional. His punches originated from unusual angles. And he wasn't just a happy warrior. He wanted to hurt; he had a bloodlust. To a degree I had also forgotten Pacquiao's high Ring IQ and how he was a real student of the sport, a fighter whose boxing brain at least equaled his elite physical and technical gifts. Almost a decade removed from his peak, Pacquiao still maintains an agile boxing mind and an improvisational genius that is a rarity in the sport. Wasting a jab or a double jab to land a left hand, moving around Broner's back to shoot a left and not get hit in return, throwing a four-punch combination where the first two shots were throwaways so he could connect with the third and the fourth, making constant adjustments with angles and foot positioning, Pacquiao reminded the boxing community that his accumulated ring wisdom is matched by few active fighters. 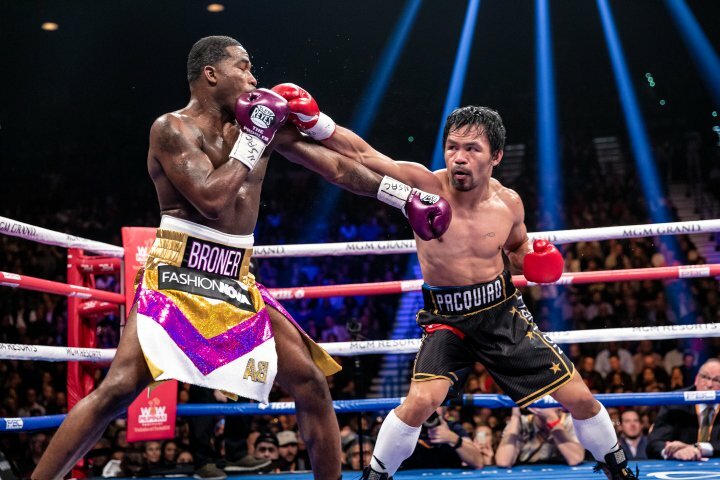 Despite possessing considerable hand speed and countering skills, Broner failed to impose himself on Pacquiao because of the same problem that has plagued him throughout his career: he had no plan. Characteristic of a number of modern American fighters, Broner is essentially a read-and-react boxer in the ring, relying exclusively on his athletic dimensions and technical skills without any notion of tactics or strategy. From moment to moment, he can score with an impressive punch. Perhaps it's his counter left hook or a lead right, but he has never thought his way through a fight against a top-level opponent. There's no sense of what Broner wants to accomplish each round. He doesn't set anything up; there are no traps set. He just sees a brief opening and shoots a punch. Maybe it lands or maybe it doesn't, but there isn't a coherent idea of what happens next. Sure, if he hurts an opponent or feels a sense of desperation, he will go on the offensive. But more likely than not he will wait at mid-range for another opportunity to connect – with the operative word being "wait." The best counterpunchers (Mayweather, Marquez and Hopkins would suffice from recent times) look to punish opponents with a coherent plan. They observe a strength in an opponent and attempt to take that away, to neutralize it. They dissuade fighters from throwing punches and erode confidence. Because Broner has lacked a systematic plan in the ring, he has failed to corral his best opponents. He'll score with two solid counter left hooks and then forget about that punch for four rounds. He'll connect with a solid jab, but won't follow it up with anything significant. He thinks a singular, solid connect should be enough, but it rarely is. Often Broner doesn't appear to be in the hurt business; his time in the ring more closely resembles "it's just business." Even the 40-year-old version of Pacquiao was light years beyond Broner in terms of putting forth the effort to win a high-level fight. Pacquiao worked more consistently and with a greater sense of purpose. In a number of rounds, Broner didn't even throw 30 punches. Pacquiao hurt Broner with punishing lead left hands and combinations against the ropes in the seventh and ninth rounds. Following up on these moments, he attempted to end the fight. At the very least, Pacquiao wanted to disabuse Broner of adventurism. And he certainly succeeded. During the championship rounds of Saturday's fight, Broner went into survival mode. Tasting Pacquiao’s best power, Broner didn't want any more; as a result, he got on his bike. Suddenly Broner, who had always been a pocket fighter, used his legs to run around the ring. He looked as sprightly on his feet as I could remember. Whereas in past fights he could have used his legs more to help win (consider his loss to Shawn Porter), now he relied on movement to make it to the final bell – not dissimilar to Shane Mosley's performance against Pacquiao in 2011. Manny Pacquiao will never again be at his absolute peak in the ring, but even this version has too much skill, savvy and desire for B-level fighters. From his tutelage under Freddie Roach, he has by now forgotten more about offensive fighting than most will ever know. And it will still take a deadly serious fighter to beat him; one who has a definitive plan and the physical and mental tools to execute it. To my eyes, only Marquez and Mayweather have beaten Pacquiao since 2005. Those are without question two of the best fighters of the last 20 years. And although it may not take an inner-ring Hall of Famer to beat him at this stage of his career, it will certainly necessitate more than a handful of singular counterpunches to do the trick. Pacquiao needs to be out-thought. With the exception of the punch from hell from Marquez in their fourth fight, Pacquiao's chin has been outstanding. It will take cunning, daring and, most importantly, commitment to oust him. And even then it may not be enough. It took a genius like Marquez a couple of fights to get the better of Pacquiao. Despite the generosity of the scorecards in their first fight, Tim Bradley, a cerebral fighter gifted both physically and technically, couldn't consistently impose himself on Pacquiao. Even at 40 Pacquiao can still compete with the likes of Mikey Garcia, Shawn Porter, Keith Thurman and Danny Garcia. Despite his advanced age, Pacquiao would still represent the best win for any of those potential opponents. And while it would be prudent to favor the younger, fresher pugilists in those matchups, consider that none of them has faced an opponent with the dimensions that Pacquiao possesses. As for Broner, his relationship with Al Haymon and his relative level of fame in the sport will ensure that he will get additional opportunities in the ring. Against top fighters at 140 lbs. and above, he has been nothing more than a high-level gatekeeper. Yes, the sport needs those types of fighters, but that was never the plan for Broner. However, in a cruel sense of irony, that seems appropriate. Plans were never really Broner's thing. Just cute sayings. Or a solid counterpunch here or there. great piece! pacman absolute legend!